Children today are under as much stress as adults. And with the busy, achievement-oriented lives they lead, kids need tools to help them self-nurture, self-adjust, and feel happy. Children are expected to behave in ways that their nervous systems cannot easily manage without physical activity, yet they are increasingly inactive in school and at home. And every day the number of children diagnosed with ADHD, Autism, and other sensory issues grow higher. Children today are under as much stress as adults. The good news is that kids can find much balance and support via natural exercise and play—in the form of yoga, meditation, and mindfulness. In the formative years of childhood, yoga is purposeful play that brings physical, mental, and emotional fitness. Yoga tools include calming breathing practices, affirmative songs for positive self-talk, and movements/poses to organize the nervous system and strengthen the physical body. Imagine a world where children grow up with yoga in their homes and their schools. Talk about a revolution! Recently I sat down with three young people who did, in fact, grow up with yoga. The first is a young woman who was my yoga student from age three until eight and recently reconnected with me after twenty years. 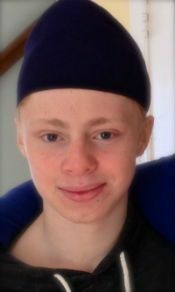 Next is a teenage boy who has been raised in a spiritual path and has done yoga since birth. And finally, an eight-year-old yoga practitioner who is also a children’s yoga teacher. In their own words, these three told me how yoga has impacted their lives as children, and how it continues to help them grow as integrated, authentic people. Madeleine holds a special place in my book, Fly Like A Butterfly, and in my heart as well. As an eight-year-old she was one of the child models in my book, and for five years I taught a weekly children’s yoga class at her Montessori school. Beginning at age three, Madeleine was one of the children who took yoga with me for all five of those years. After being out of touch with Madeleine for decades, she found me on social media around two years ago. I am delighted to say that we have been talking back and forth ever since. She is now twenty-five and an accomplished hatha yoga teacher in Santa Barbara, California. Shakta: It is thrilling to reconnect with you, Madeleine. I am wondering what you most remember about your yoga classes with me when you were young? Madeleine: I remember doing the washing machine exercise when I was really little, like three or four. Then candlestick was more fun by the time I was eight. I know it is actually called shoulderstand, but I still like calling it candlestick! Shakta: I am wondering about the years between Montessori school and adulthood. Did you just continue to do yoga on your own? 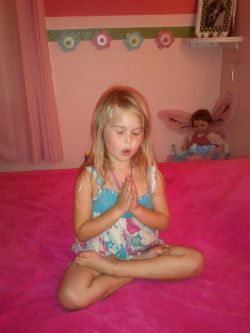 Madeleine: Once I stopped Montessori school, I stopped doing yoga. It was a huge transition when I started public school. For example, in public school we were sitting all the time, not like in the Montessori classroom where we moved around and chose our work. I stopped doing yoga, but it was always there for me—emotionally—when I needed it. Another thing that was really different was that I was expected to do physical fitness in public school. PE was kind of scary to me. Yoga was never scary, I guess because it was only about what you could do. I never enjoyed sports or competitive things, and that’s why PE was scary. I stopped doing yoga, but it was always there for me—emotionally—when I needed it. Shakta: So tell me, how did you get back into yoga? Madeleine: When I was fifteen and in boarding school, I remember seeing pictures of people on the internet who were doing yoga. My thought was, “Oh, I remember doing that!” So I got some videos and practiced by myself throughout high school. Then in college I took a class. Shakta: How wonderful! And this lead to you becoming a yoga teacher? Madeleine: Sharing yoga with friends lead to becoming a trained yoga teacher. Back in high school I started teaching my friends…I still called shoulderstand “candlestick” and things like that. Shakta: I always think it is good to lighten up about yoga and help people relax and laugh. Madeleine, I’ve seen you doing some very impressive arm-supported poses. What do you think about the current image that yoga has—for example, the way yoga is portrayed as super-fit people doing poses that are impossible for most people? Shakta: Sounds like you do it because you enjoy it. I can go to a yoga class anywhere in the world and feel that I am back home. I teach full time, fourteen classes a week. It’s my life now! I feel really lucky because I could never work in an office. And you know, I feel really honored. All these people come into one room together. It is probably the one time of the day that they don’t have their cell phones. They aren’t paying attention to anything else. No technology, just breathing. We are all just breathing together. It feels like home. And I can go to a yoga class anywhere in the world and feel that I am back home. Shakta: Now you are inspiring me, your original teacher! Madeleine: (Laughing) I love how it helps with everyday life. I had asthma as a child, and yoga and meditation have helped me to breathe better. Yoga has helped me to be more mindful, to pay attention to my body and what’s going on around me. Lately I’m noticing the difference between emotions, how they come and go, compared to things in life that are more permanent. I love how yoga helps you realize that what is going on in the moment is a mirror for how you are feeling in that moment. For example, if I really want to get into a pose and it is not happening, I can be aware of what’s going on in my body, I can recognize it outside of class too. I can recognize that I need to calm down a little. I can work with that same feeling when it is happening in traffic. I can notice it and change it instead of getting overcome by things happening around me. And, Shakta, I am just wondering—how do you do that with children? Shakta: Little children understand these things if you put it in language they can understand. That’s what I do in my Radiant Child Yoga work, and that is what I did with you all those years ago in the Montessori school! Madeleine: I’ll never forget the spaghetti test [see practice below]. I wish I could do it with my adult students to help them experience what it feels like to relax. It’s such good biofeedback! I wonder what will happen with all these children who grew up with yoga? Something great I think! Shakta: Something like what has happened for you, my dear Madeleine! Lie down on the floor, face up, arms at your sides. Imagine you are stiff like spaghetti when it is in the box. Inhale and tense your entire body. Exhale and be like cooked spaghetti—soft and relaxed. Do this three times. Have a friend test you to see if you are “cooked” by gently picking up one arm and wiggling it to see if it is relaxed. I met Guru Fateh Singh when he was three days old. His name means “victory of the inner wisdom.” His parents have been good friends and part of my spiritual family for the past twenty years or so. From the start I have had a special relationship with Guru Fateh, and along with his sister, he is my godchild. When he was seven, Guru Fateh partnered with me to create the Yoga Warrior Cards, which I've found boys especially love because the illustrations resemble Transformers doing yoga! Guru Fateh: I was born into a family that did yoga. I would go into my parents’ room and do yoga along with my parents. It was part of what we did every day. Shakta: When did you start doing it on your own? Guru Fateh: I remember my parents would make me do yoga every day, but then after a while I started to do it on my own. It was first like a habit, compulsory. But then I started to enjoy it. I would feel that I was missing something when I didn’t do it. When I opened my eyes after the morning meditation, I felt 100%. I felt complete. Shakta: I like that idea, feeling 100%. Can you give some specific ways that doing a steady yoga and meditation practice help you? Guru Fateh: I mostly find it helps with challenges in everyday life; I feel like it helps me focus on what I need to do. And with strong emotions—like if I was really sad, it could make me feel happier. The science behind how yoga works is that it helps your brain secrete dopamine, so feeling happier is actually a chemical reaction. And it helps the spinal fluid move up so it affects your brain in a positive way too. I mostly find it helps with challenges in everyday life; I feel like it helps me focus on what I need to do. Shakta: All really good to know. Now that you are a teen, do you ever share yoga with others, like your friends? Guru Fateh: I haven’t had much experience with that, but a few times I have heard them say, “Wow! I should start doing yoga!” But right now, none of my friends seem to have a need for it. It would be a bit intrusive to just start talking about it. But in certain circumstances, like if they seemed to need some help and yoga would be appropriate, then I would. Here’s an example. Once our family was at the airport and someone asked us about why we were wearing turbans. So one thing led to another, and we started talking about the yoga path. Then he asked us for a meditation for depression. We gave him one, just a simple breath meditation. Shakta: I love that—planting yoga seeds! You never know how they will blossom. So with the idea of planting seeds, would you recommend that parents share yoga with kids while they are young? Guru Fateh: Definitely. When you start yoga when you are young, your brain develops with the help of yoga and meditation. And if you are consistent with it, yoga continues to help you as you grow up into an adult. It helps you feel good and handle things better. Shakta: What’s your favorite yoga pose? Yogi Bhajan, said, “If you master your breathing, you master yourself.” And this is what I feel with this meditation. Guru Fateh: Probably warrior or archer pose. I also have a particular meditation that I like. It’s called So Darshan Chakra Kriya, and it is super-strong. It uses breath control and a silent mantra on the breath. My teacher, Yogi Bhajan, said, “If you master your breathing, you master yourself.” And this is what I feel with this meditation. Shakta: Can you give us one simple yoga tool that can be done on the spot? Guru Fateh: Depending on what the situation calls for, either long deep breathing for calming or breath of fire for revitalizing [see practices below]. You can do them anywhere. Shakta: Thank you Guru Fateh! And may your yoga continue to serve you well. Long Deep Breathing: Find a comfortable seated position. You may like to place one hand on your abdomen and one on your chest to get the feel for “belly breath.” Exhale all the breath out, making room for a full breath in. Inhale from the belly up to the chest as slowly as you can without straining. Exhale from the chest to the belly as slowly as you can. As you become familiar with the long deep breath, add a slight pause at the end of the inhalation and exhalation. Keep your eyes closed and feel a soft focus at the forehead area between the eyebrows. This is called the ajna, or intuitive center. Breath of Fire: From your comfortable seated position, place one hand on your abdomen. Inhale normally, and then exhale with a force so that your belly presses in toward the spine. The diaphragm will naturally move up, pressing the breath out. Relax the belly. The diaphragm will drop, and the inhalation will come in naturally. As you feel comfortable with the breathing pattern, begin to do it more quickly and rhythmically. If you find it difficult in the beginning, pant through your mouth at a moderate pace. This gives you a feel for the pace and mechanics of breath of fire. When you feel ready, switch to breathing through your nose. 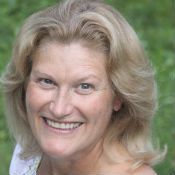 Susan Kalchman is a Radiant Child Family Yoga 200-hour teacher in California. She would occasionally send me inspiring videos of her eight-year-old daughter, Abi, teaching younger students. In a recent phone conversation, Susan recalled Abi’s introduction to yoga as a crawler. Susan: Abi would come crawling onto my lap when I was sitting and meditating. If I was holding yoga postures or doing Kundalini Yoga movements, she would sit down and copy me. She just wanted to do what I was doing. At first I was not very happy with being interrupted at what I thought of as “my special time,” but then I had the realization that something important was naturally happening, and I would be crazy to discourage it. My inner wisdom took over, saying something like, “Don’t push it away. Take advantage of her desire to be part of the yoga.” So I started doing yoga in a way that she could do it with me. Shakta: All of this developed so naturally. What happened next? Shakta: Again, a natural development! Susan: Yes, it was all very simple and flowing. Once Abi became really familiar with the experience and tools of children’s yoga, she and I began to take it to school—to her classmates, as well as younger children. Right now, Abi goes with me every week to teach yoga in several schools, including Montessori schools. Shakta: Abi, you have been doing yoga your whole life. Why do you like it so much? Abi: Because I get calm, and I feel that I can connect with my body. I can just relax and pay attention to my body. I don’t feel like I have do anything—I just feel peaceful. I feel strong inside. It helps me to focus on one thing. I like to do it before school because then I can focus and believe in myself. Shakta: What does it feel like to be a teacher? Abi: It feels good. 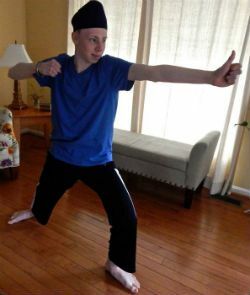 I can connect with other children and help them do poses. We also do affirmations and meditations. Shakta: What are your favorite poses? Abi: Well, my favorite pose for myself is rocket ship [shoulderstand]. And I like to lead the children in down dog and shoulderstand. I go around and help them in the poses sometimes so they can keep their balance and really get a lot out of it. Abi: My best meditation is Sa Ta Na Ma [see practice below]. I like the way it feels when I press the fingers and concentrate on that feeling. I also really like positive affirmations. And I listen to mantra music before bed and it helps me sleep peacefully. Shakta: I agree completely. These are good things to know, right? Anything else you like to do with yoga? Abi: Sometimes I lead yoga with my friends when they come over to play. They like it. I like to teach my friends rocking bow and they really like crow pose. Shakta: That is impressive. All that focus and balancing! Abi: (giggles). Yeah! But with the little kids we do washing machine, frog jumps—fun stuff from Fly Like a Butterfly. Susan: She works on the poses because she wants to accomplish them. She has a lot of focus and strength, which I attribute to practicing yoga for so many years. Abi, tell Shakta about the work you did using the mirror. I knew that once I pictured it, focused on it, then I believed in myself. Then I tried it and was able to do it. Abi: Well, I wanted to work on a skill in gymnastics, and I didn’t know how to do it, so I went to my room to meditate. I sat in front of a mirror and looked at myself in the eyes. Then I closed my eyes and pictured myself doing the new skill that I never did. And I knew that once I pictured it, focused on it, then I believed in myself. Then I tried it and was able to do it. Susan: She figured this out for herself. I know that the qualities of yoga permeate her life. It comes through in different ways, and for me this is one huge way. She recognized that tool and she knew she had to go inside to get it. Shakta: Abi, what you know at such a young age will serve you your whole life. You are really fortunate that it comes so naturally to you. I’m inspired! This meditation is good for everyone and can be especially good for those with sensory integration challenges. In the beginning, let the children watch their hands press each finger as they make the sound out loud. After some sessions out loud, add in the whisper, then add in silent voices. Each syllable is a sound vibration with a specific meaning: Sa—the universe, totality; Ta—life, creation; Na—death, dissolution; Ma—rebirth, regeneration. Voice: There are three “voices” used in this meditation. They are the human voice (chanting out loud), the voice of the beloved (whispering), and the inner voice (silent repetition of the mantra internally). Mouth movements: During the chanting, you may notice that your tongue touches your upper palate, pressing the many meridian points there. These movements stimulate certain configurations that activate higher brain functions. As you chant Sa, press your thumb and index finger together. As you chant Ta, press your thumb and middle finger together. As you chant Na, press your thumb and ring finger together. As you chant Ma, press your thumb and little finger together. In pressing each finger firmly, sensitive pressure points are stimulated, and coupled with the meridians in the upper palate that are activated, create positive changes in the brain, especially the memory centers. This has been demonstrated in a study in which this meditation was practiced during a PET scan, lighting up different brain centers. I hope you are as inspired by these three young yogis as I am. Inspired to share yoga with children in the most natural, loving way that makes sense for you, your family, and your students. Inspired to see a world where movement, breath, and awareness are commonplace in schools and in home life. A world where every child and adult knows that they have what it takes inside of them to handle the challenges of life. As Madeleine, Guru Fateh, and Abi clearly demonstrate, growing up with yoga can be an organic process that has a profound impact. One heart, one mind at a time.